(15Aug03) This issue will rerun the taped seam essay. The 1Sep issue will give thoughts about measuring propeller thrust. 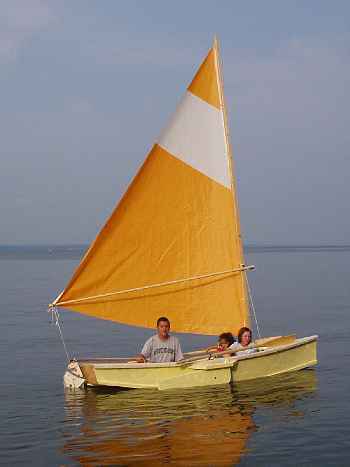 Mike Cerio takes his new Mayfly12 out for a spin. 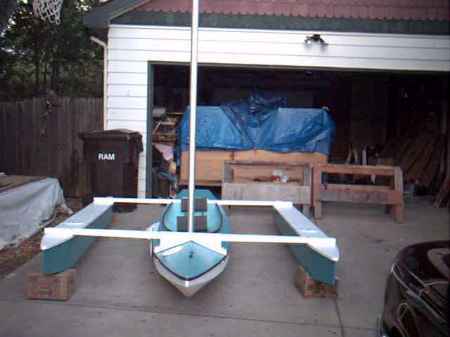 ...We'll think about measuring the thrust at the prop of a moving boat. 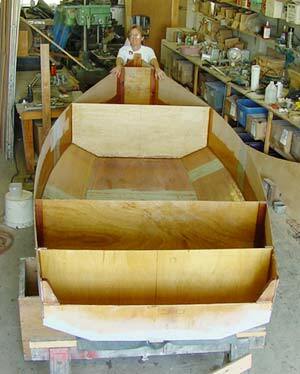 The shape of these hulls is totally tradional and effective. 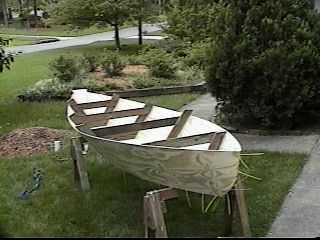 The sides have constant flare almost the entire length except at the bow. There we find a great twist to the planks to get a stem that is nearly vertical. Flare is nearly always good in a rowing boat because it gives both the narrow bottom that benefits speed and the wide top that gives good spread for the row locks plus extra room and stability. The vertical stem gives more waterline length which implies more speed. 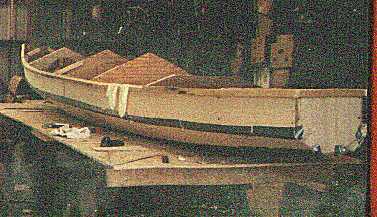 The bottom treatment has the stem always just out of the water to encourage the boat to go over the water instead of plowing through it. Then the bottom runs straight back and down to a point just past the midsection and then it turns quickly up to well above the the normal waterline. 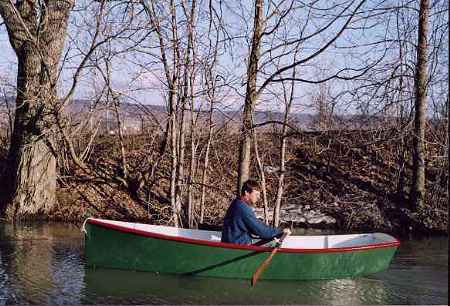 The idea is to load a boat like this with extra weight in the stern to keep the stem just clear of the water. The result is a lot of capacity. 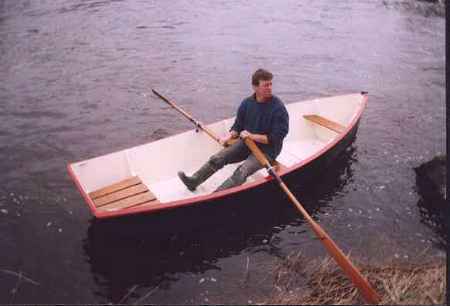 Seal Cove can easily take two full sized men which is unusual for a 12' rowing skiff. 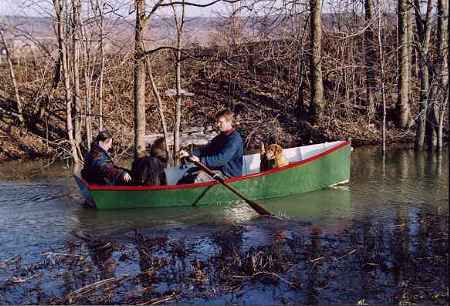 Here is another photo of Pierre's boat with wife and dogs aboard. Note that the stem is still out of the water. 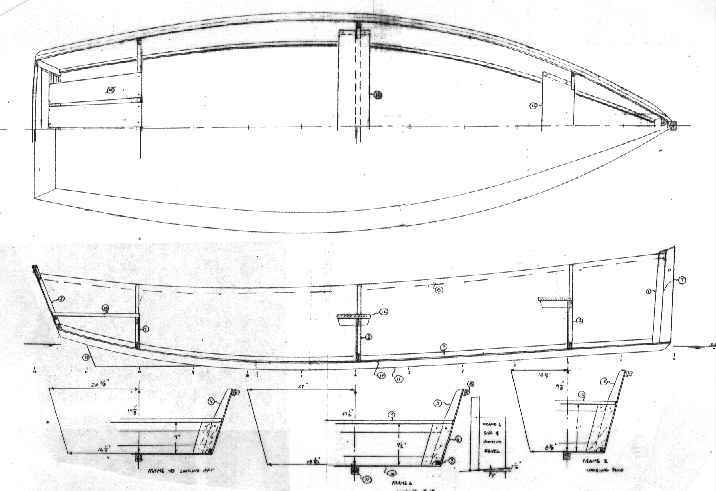 The stern has sunk under the passenger's weight but not enough to immerse the flat transom. Another loading scheme might be with both dogs up front, or with the rower in the front seat. 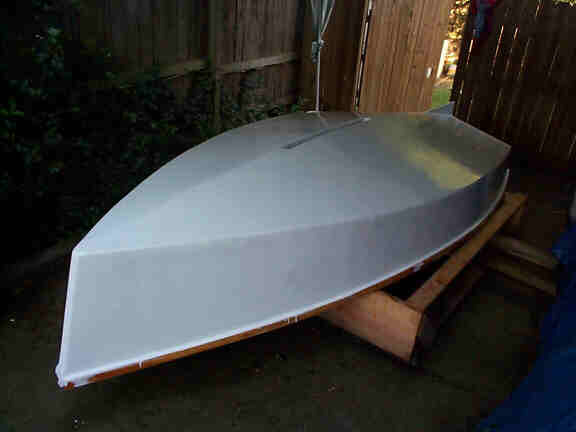 Plans for Seal Cove Skiff are $20 when ordered directly from me. You can also buy them online at www.duckworksmagazine.com. 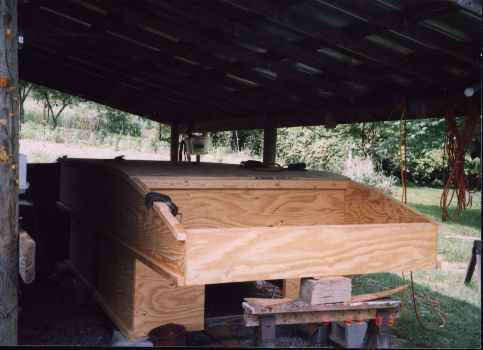 An upside down plywood box I'm told is the true 16' Shanteuse (at last) is going together in Tennessee.